I got 36.9 mpg in about a 50-50 mix of city and highway driving and sometimes with several folks aboard. The EPA rates the hybrid at 40 mpg city and 37 mpg highway. Even with low-cost gas at the moment it’s nice to fill up at $11 for a week’s driving. So it’s easy to get into this handsome, youthful sedan that will carry five adults comfortably. Being a hybrid though the trunk is reduced a bit for battery storage. This one ranks 13.1 cubic feet, but it’ll still hold 3-4 suitcases easily. 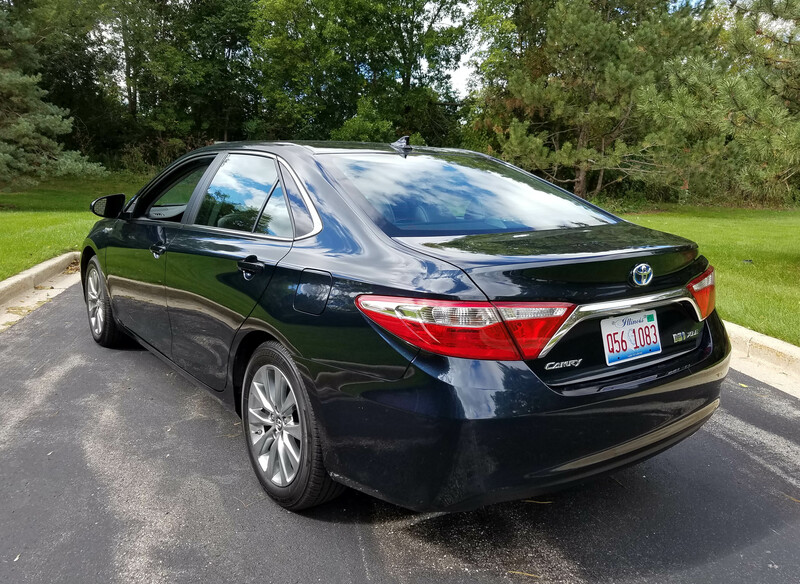 Unlike the Honda Accord hybrid, the Camry’s rear seat will still fold down too and has a pass-through, giving it more utility. Toyota’s 2.5-liter I4 with variable valve timing is plenty strong when hooked up with the electric hybrid system. Camry is rated at 200 horsepower and 156 pound-feet of torque. It actually feels quick away from a stoplight and with the electric power giving it instant torque off the line it steps lively and quietly. If you were to go with a standard gas-powered engine, Toyota offers a similar 2.5-liter I4 with 178 horsepower or a 3.5-liter V6 that delivers 268 horses while trimming fuel economy to 21 mpg city and 30 mpg highway. Camry has a mostly pleasant ride too, which is what you want, and expect, in a family sedan. 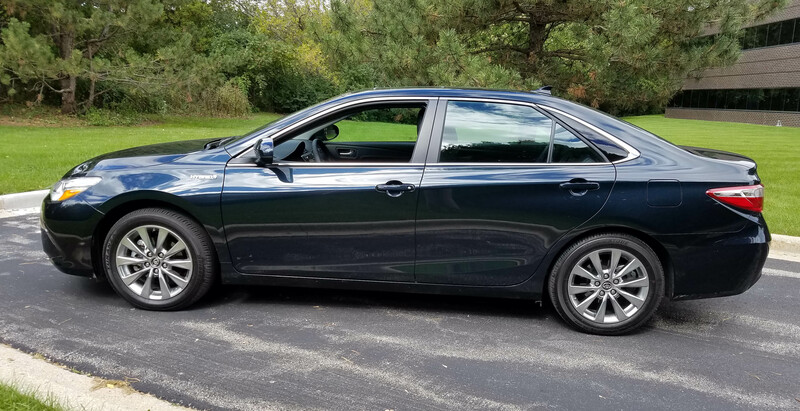 The ride has been firmed some over the past few years, which makes the car feel a bit more responsive overall, but also transmits a few bumps to the cabin. Standard are 17-inch tires. Handling is light and easy, but certainly nothing to get excited about. There is some body lean in tight turns too. Braking is fine and both stability and traction control are standard. 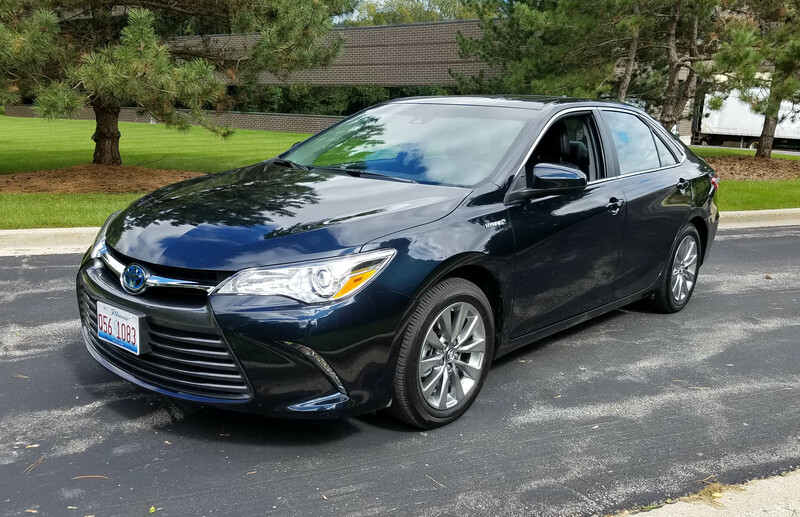 Shifts from the electronically controlled continuously variable transmission are smooth and mate well with Camry’s hybrid power. The car also includes an Eco mode button on the console if you wish to lower your acceleration to further save fuel. Inside, the dark bluish gray test car was quiet, roomy and comfortable. The XLE features a leather interior with power heated front seats. These were black with gray stitching while the dash featured black fake wood plus matte silver trim. Seats are mildly contoured and were harder than I like. 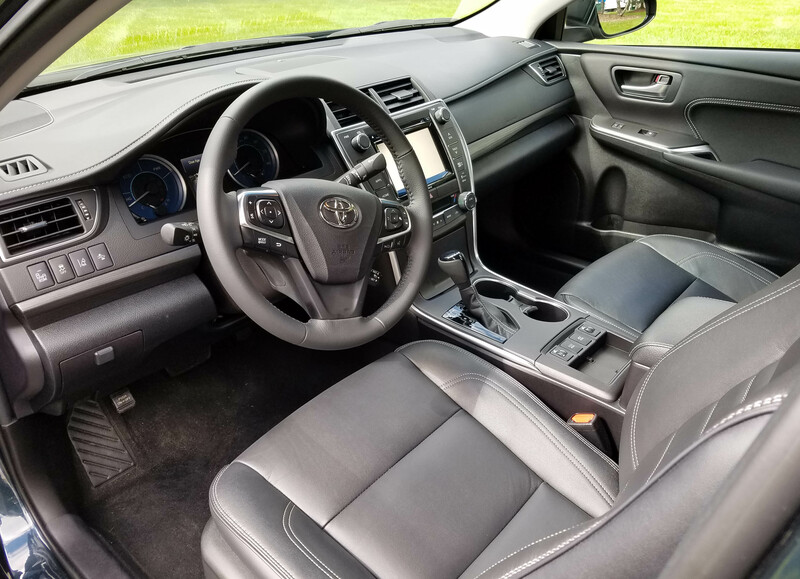 Past Camry seats have been more comfortable and I’d suggest trying out the lower trim lines to see if the cloth seats feel more compliant than these leather ones. Camry’s dash is well laid out and the XLE features a dual climate control system standard. Knobs and controls are large and easy to use and see. This model also features a larger radio/navigation screen than in lower trim lines. That’s appreciated by most drivers and helps you see the rear-view camera’s view better. The Entune entertainment system and radio also are easy to tune and use, something fewer and fewer car makes can claim. The test car added the Entune package that includes a premium JBL sound and navigation system for $710 extra. Other add-ons included a Safety Connect package that is like several other SOS systems. It allows you to call for assistance at the push of a button, will trace your car’s location if it’s stolen and automatically calls for help if you’re in an accident. The system costs $515. Also extra is a blind-spot monitor with rear cross-traffic alert for $500, and well worth it. Along the same lines is an advanced technology package for $750 that includes a pre-collision system that brakes the car if something is detected in your lane, dynamic cruise control, automatic high-beam lights and the ever annoying lane departure system. A convenience package adds HomeLink and an anti-theft system for $345. While overhead is a moonroof that adds $910 to the cost. Toyota is a master at including little extras to make their cockpits more user friendly. 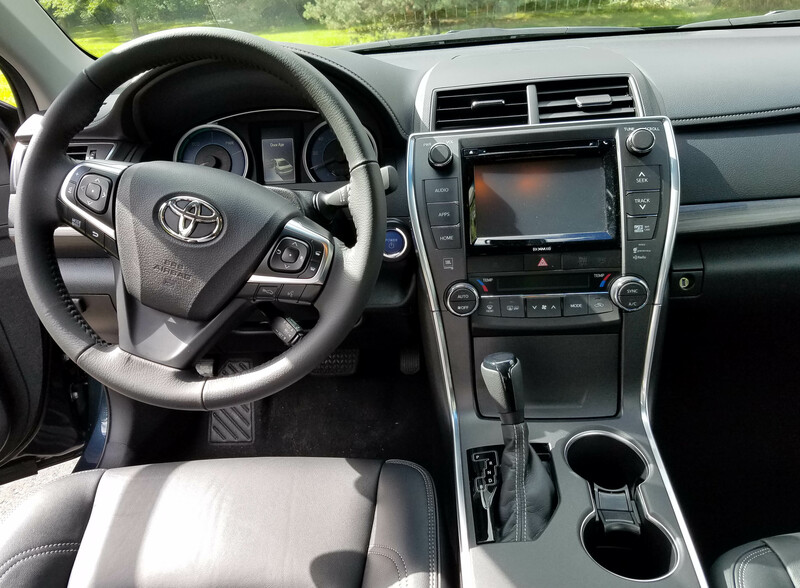 The Camry adds a small coin holder cubby in the dash, a big cubby under the center stack, two cupholders (naturally) and a flat area for recharging your phone on the console. There are two 12-volt power outlets, one USB port and one auxiliary outlet. Even the door armrests and center console armrests are well padded. Overhead the Camry’s visors extend to block side sun and feel much sturdier than in the last Camry I tested. There are the usual radio, phone and trip computer controls on the manual tilt/telescope steering wheel hub, and a stalk for the cruise control. 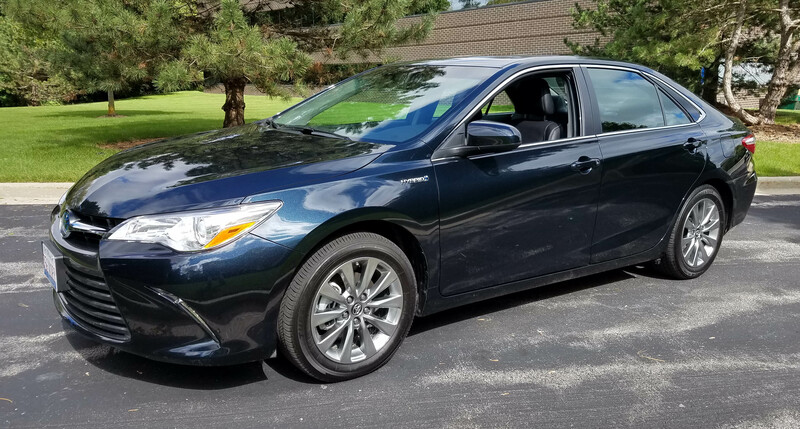 Overall the Camry is nothing fancy (other than the extra high-tech add-ons), but it’s a well-equipped, handsome and roomy family sedan. And it’s all for a modest price that is somewhat surprising, especially for a hybrid. Hits: Excellent fuel economy, power and pleasant ride. Comfortable, quiet and roomy interior with well laid out dash. Power leather seats, heated front seats, blind-spot warning, crash warning, sunroof and visors that extend.